Villefranche on the French Riviera hosted a “mountain cruise day” on Oct. 21 for passengers from the Liberty of the Seas and the Grand Holiday. 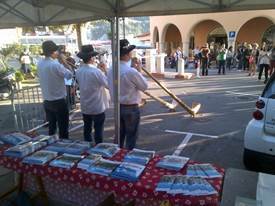 Organized by the city of Villefranche-sur-Mer and the French Riviera Cruise Club, the one-day event treated passengers from both ships to entertainment and activities, promoting the mountain area, which is only about an hour’s drive from the coast. The idea behind the event was to promote shore excursions to the mountain areas, as well as to encourage passengers to come back during the winter months. Tourism interests from the area presented their products for the coming winter season: the General Council of the Alpes Maritimes promoted activities like the discovery of wild animals, mountain cycling and horseback riding; the Riviera Tourism Board presented the new “Cote d’azur-CARD;” and various regional tourism offices presented ski resorts such as Mercantour and Valberg. Mountain activities are also among the tours proposed to the cruise lines by the French Riviera Cruise club in their new catalog, called A Cruise of Discovery.